Here's another great all-color 1958 Studebaker ad courtesy of Aldenjewell. Studebaker was no stranger to using low-cost cars to pull buyer interest, having done so successfully in the past with the wonderful 1939 Champion. In the recession year of 1957, they returned to the Champion strategy, de-contenting their full-size cars in order to lower the price fairly dramatically. 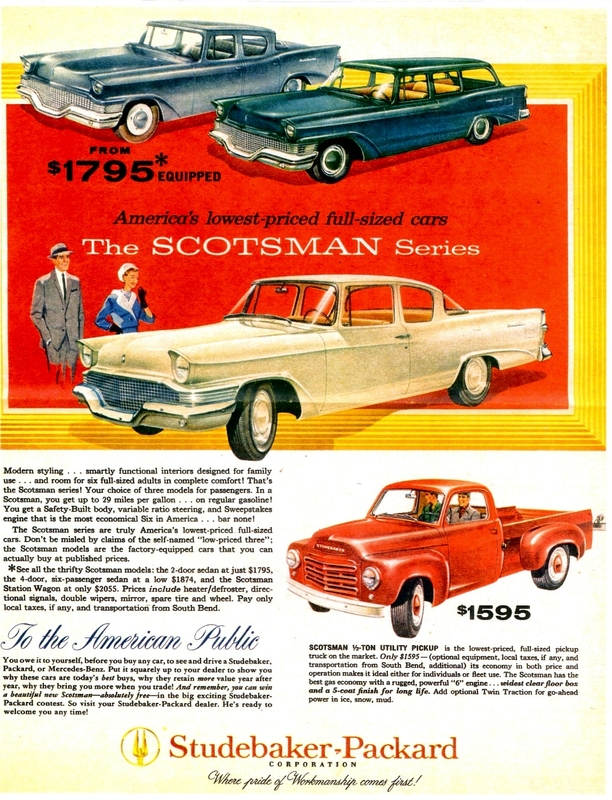 They named these cars Scotsman, and they did reasonably well; well enough to reappear in the Studebaker lineup during the following model year as well. Scotsman cars (and trucks) lacked such niceties as bright window trim, carpet, chrome front bumpers and even passenger sun visors and arm rests, although you could option-up these extras if you wanted. The '58s weren't as much of a sales success as the '57s were, but they kept scarce dollars coming into the Corporation long enough to fund the launch of the Lark in 1959 - the car that saved the company (temporarily, at least). Studebaker would revive the Scotsman concept one last time, with 1963's Standard line and 1964's Challenger model. Some ideas just never go out of style.